Joey Barton available for £1.5m – West Ham & Aston Villa line up bids. Words by Kevin Doocey on December 21, 2010 . Everything that you hear from Newcastle United nowadays must be taken in with quite the opposite. Since Mike Ashley took over the club, things are gone bezerk to say the very least. As I said in my last article, we cannot really trust the owners of the club until they have handed over the keys to new owners and are on their way home - indeed the likelihood of that happening is quite low. Only a couple of days ago, Alan Pardew reiterated that he was not going to sell any of his key players, and Joey Barton, the tenacious midfielder is definitely one of our key players this season, with nearly five assists, and a couple of important goals. Obviously Pardew’s statement when he took over of going ‘toe to toe with Mike Ashley’ if he did not agree with his decisions, does not bode too well with the happenings today. Saying that, it doesn’t come as a surprise whatsoever. We do expect a few players to leave, and none to come in to put it bluntly. We could well lose Andy Carroll this transfer window, despite Pardew resisting rumours that he will allow the Geordie lad to leave. Back to Barton though - £1.5m for his services? What a ridiculous fee, who on earth came up with this supposed asking price? £1.5m for one of the most performing midfielders in the Premier League, in his prime at 28 years of age, and just getting beyond his years of troubles. Yet, Newcastle United are expected to sell the lad, to raise funds, and to reduce the wage bill. All very well, but £1.5m is pennies, we could not do anything with that, and the fact he wants to reduce the wage bill, well get rid of Alan Smith, Xisco. Both of those players barely feature in the team, and are leeching off the club, up on £50,000 a week too. If my estimates are correct, I think we’d at least get £1.5m for Alan Smith alone, and maybe more than £2m for Xisco if we play our cards correctly. However, this business is just too sophisticated to the hierarchy of Newcastle United - they like to do things the worst way possible. The message being, if you want to raise funds and reduce the wage bill, sell the like of Alan Smith, Xisco if need be. Do not go near ur best midfielder in years, and try flogging him to grateful clubs like West Ham or Aston Villa for pennies. Mind you, there is some good news. Joey being the person he is will not want to leave the club. He still owes us a lot on the field, and he knows that - it is something that he has been working towards since his release from prison those many months ago. Would Joey Barton go West Ham a club labouring the bottom 3, with likely relegation looming? I think not. Would he join Aston Villa, another club struggling with new manager Gerard Houllier? Probably. Add all that to fact that we are above both of them in the Premier League, and defeated both of them this season whilst Chris was manager of the club. None of this makes financial, or logical sense, but do Newcastle United know this? I guess not. We can only wait and see what happens in the next couple of days, but we really hope NUFC realise what they might be putting themselves in for if they shift Joey Barton to another club, for £1.5m - the price of Leon Best. Anyway, make sure you follow Tyne Time on Twitter @TyneTime - it is where our breaking news will appear first! Seriously where did you actually get this figure? Why would Ashley pay 3.5million for tiote in the summer, then sell barton for 1.5 million. Obviously hes on big wages but he is our best player, probably more important than Carroll. Is 'nearly 5 assists' in actual fact 4 then? I'm a Villa fan, i hope we do take him for £1.5m, that would be an amazing piece of business. Thanks. "Skysports.com understands Newcastle are prepared to sell Joey Barton......" What years as a football fan has taught me skysports.com understands is as useless as saying "news of the world understands". Dont beleive it until its on proper sky sports news. Skysports.com understood Otmar Hitzfeld was coming in to replace bobby robson. 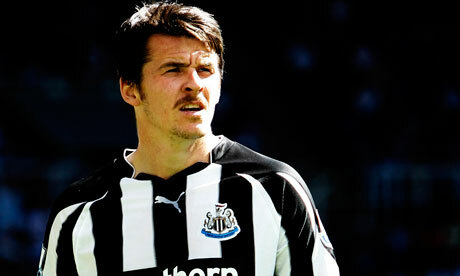 Scotty PArker is rated at £15million, so should be Joey Barton! Which one is Alan Smith? Newcastle need him, we don't want him. Looks like there is 1 solution to make both parties happy!